For most Americans, Independence Day means firecrackers and cookouts. The Declaration of Independence—whose proclamation, on July 4, 1776, we celebrate—doesn't feature. Contemporary Americans are less likely to read it now that it’s easily available on the Internet, than when it relied on horseback riders for its distribution. Thomas Jefferson, the author of the Declaration, called it "an expression of the American Mind." An examination of Jefferson's constitutional thought makes plain that he would no longer consider the collective mentality of contemporary Americans and their leaders (Rep. Ron Paul excepted) "American" in any meaningful way. For the Jeffersonian mind was that of an avowed Whig—an American Whig whose roots were in the English, Whig political philosophy of the seventeenth and eighteenth centuries. The essence of this "pattern of ideas and attitudes," almost completely lost today, explains David N. Mayer in The Constitutional Thought of Thomas Jefferson, was a view of government as an inherent threat to liberty and the necessity for eternal vigilance. Indeed, especially adamant was Jefferson about the imperative "to be watchful of those in power," a watchfulness another Whig philosopher explained thus: "Considering what sort of Creature Man is, it is scarce possible to put him under too many Restraints, when he is possessed of great Power." "As Jefferson saw it," expounds Mayer, "the Whig, zealously guarding liberty, was suspicious of the use of government power," and assumed "not only that government power was inherently dangerous to individual liberty but also that, as Jefferson put it, 'the natural progress of things is for liberty to yield and government to gain ground.'" By "all men are created equal," moreover, Jefferson, who also wrote in praise of a "Natural Aristocracy," was certainly not implying that all men were similarly endowed. Or, that they were naturally entitled to healthcare, education, a decent wage, amnesty, or entry into the country he and the Constitution makers bequeathed. Rather, Jefferson was affirming the natural right of "all men" to be secure in their enjoyment of their "life, liberty and possessions." 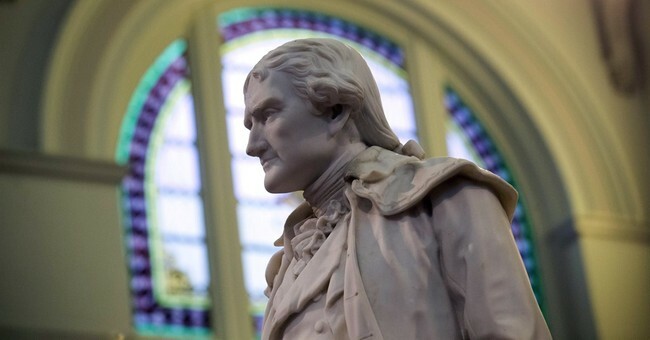 But Jefferson's muse for the "American Mind" is even older. Our Founding Fathers' political philosophy originated with their Saxon forefathers, and the ancient rights guaranteed by the Saxon constitution. With the Declaration, Jefferson told Henry Lee in 1825, he was also protesting England's violation of her own ancient tradition of natural rights. As Jefferson saw it, the Colonies were upholding a tradition the Crown had abrogated. Philosophical purist that he was, moreover, Jefferson considered the Norman Conquest to have tainted this English tradition with the taint of feudalism. "To the Whig historian," writes Mayer, "the whole of English constitutional history since the Conquest was the story of a perpetual claim kept up by the English nation for a restoration of Saxon laws and the ancient rights guaranteed by those laws." If Jefferson begrudged the malign influence of the Normans on the natural law he so cherished, imagine how he'd view America’s contemporary cultural and political conquistadors—be they from Latin America, the Arabian Peninsula, and beyond—whose customs preclude natural rights and natural reason! The settlers spilt their own blood "in acquiring lands for their settlement," he wrote with pride in “A Summary View of the Rights of British America.” "For themselves they fought, for themselves they conquered, and for themselves alone they have right to hold." Thus, they were "entitled to govern those lands and themselves."